Not to be confused with Bill Kristol. William Edward Crystal (born March 14, 1948) is an American actor, comedian, writer, producer, director, and television host. He gained prominence in the 1970s and 80s for television roles as Jodie Dallas on the ABC sitcom Soap and as a cast member and frequent host of Saturday Night Live. He then became a Hollywood film star during the late 1980s and 1990s, appearing in the critical and box office successes The Princess Bride (1987), Throw Momma from the Train (1987), When Harry Met Sally... (1989), City Slickers (1991), Mr. Saturday Night (1992) and Analyze This (1999), and providing the voice of Mike Wazowski in the Monsters, Inc. films starting in 2001. He has hosted the Academy Awards nine times, beginning in 1990 and most recently in 2012. Crystal was born at Doctors Hospital on the Upper East Side of Manhattan, and initially raised in The Bronx. As a toddler, he moved with his family to 549 East Park Avenue in Long Beach, New York, on Long Island. He and his older brothers Joel and Richard, nicknamed Rip, were the sons of Helen (née Gabler), a housewife, and Jack Crystal, who owned and operated the Commodore Music Store, founded by Helen's father, Julius Gabler. Jack was also a jazz promoter, a producer, and an executive for an affiliated jazz record label, Commodore Records, founded by Helen's brother, musician and songwriter Milt Gabler. Crystal is Jewish (his family emigrated from Austria and Russia), and he grew up attending Temple Emanu-El (Long Beach, New York) where he was Bar Mitzvahed. The three young brothers would entertain by reprising comedy routines from the likes of Bob Newhart, Rich Little and Sid Caesar records their father would bring home. Jazz artists such as Arvell Shaw, Pee Wee Russell, Eddie Condon, and Billie Holiday were often guests in the home. With the decline of Dixieland jazz and the rise of discount record stores, in 1963 Crystal's father lost his business and died later that year at the age of 54 after suffering a heart attack while bowling. His mother, Helen Crystal, died in 2001. After graduation from Long Beach High School in 1965, Crystal attended Marshall University in Huntington, West Virginia, on a baseball scholarship, having learned the game from his father, who pitched for St. John's University. Crystal never played baseball at Marshall because the program was suspended during his first year. He did not return to Marshall as a sophomore, instead deciding to stay in New York to be close to his future wife. He studied acting at HB Studio. He attended Nassau Community College with Janice and later transferred to New York University, where he was a film and television directing major. He graduated from NYU in 1970 with a BFA from its School of Fine Arts, not yet named for the Tisch family. One of his instructors was Martin Scorsese, while Oliver Stone and Christopher Guest were among his classmates. Crystal returned to New York City. For four years he was part of a comedy trio with two friends. They played colleges and coffee houses and Crystal worked as a substitute teacher on Long Island. He later became a solo act and performed regularly at The Improv and Catch a Rising Star. In 1976, Crystal appeared on an episode of All in the Family. He was on the dais for The Dean Martin Celebrity Roast of Muhammad Ali on February 19, 1976, where he did impressions of both Ali and sportscaster Howard Cosell. He was scheduled to appear on the first episode of NBC Saturday Night on October 11, 1975 (The show was later renamed Saturday Night Live on March 26, 1977), but his sketch was cut. He did perform on episode 17 of that first season, doing a monologue of an old jazz man capped by the line "Can you dig it? I knew that you could." Host Ron Nessen introduced him as "Bill Crystal". Crystal was a guest on the first and the last episode of The Tonight Show with Jay Leno, which concluded February 6, 2014, after 22 seasons on the air. Crystal also made game show appearances such as The Hollywood Squares, All Star Secrets and The $20,000 Pyramid. To this day, he holds the Pyramid franchise's record for getting his contestant partner to the top of the pyramid in winner's circle in the fastest time: 26 seconds. Cast of Soap (1977). Back row, L-R: Robert Urich, Ted Wass, Richard Mulligan, Robert Guillaume, Robert Mandan, Jimmy Baio, Diana Canova, Arthur Peterson Jr.. Seated: Billy Crystal, Cathryn Damon, Katherine Helmond, Jennifer Salt. Crystal's earliest prominent role was as Jodie Dallas on Soap, one of the first unambiguously gay characters in the cast of an American television series. He continued in the role during the series's entire 1977–1981 run. 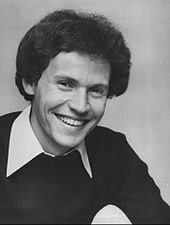 In 1982, Billy Crystal hosted his own variety show, The Billy Crystal Comedy Hour on NBC. When Crystal arrived to shoot the fifth episode, he learned it had been canceled after only the first two aired. After hosting Saturday Night Live twice, on March 17, 1984 and the show's ninth season finale on May 5, he joined the regular cast for the 1984-85 season. His most famous recurring sketch was his parody of Fernando Lamas, a smarmy talk-show host whose catchphrase, "You look... mahvelous!," became a media sensation. Crystal subsequently released an album of his stand-up material titled Mahvelous! in 1985, as well as the single "You Look Marvelous", which peaked at No. 58 on the Billboard Hot 100 in the US, and No. 17 in Canada. Also in the 1980s, Crystal starred in an episode of Shelley Duvall's Faerie Tale Theatre as the smartest of the three little pigs. In 1996, Crystal was the guest star of the third episode of Muppets Tonight and hosted three Grammy Awards Telecasts: the 29th Grammys; the 30th Grammys; and the 31st Grammys. In 2015, Crystal co-starred alongside Josh Gad on the FX comedy series The Comedians, which ran for just one season before being canceled. Crystal's first film role was in Joan Rivers' 1978 film Rabbit Test, the story of the "world's first pregnant man." Crystal appeared briefly in the Rob Reiner "rockumentary" This Is Spinal Tap (1984) as Morty The Mime, a waiter dressed as a mime at one of Spinal Tap's parties. He shared the scene with a then-unknown, non-speaking Dana Carvey, stating famously that "Mime is money." He later starred in the action comedy Running Scared (1986) and was directed by Reiner again in The Princess Bride (1987), in a comedic supporting role as "Miracle Max". Reiner got Crystal to accept the part by saying, "How would you like to play Mel Brooks?" Reiner also allowed Crystal to ad-lib, and his parting shot, "Have fun storming the castle!" is a frequently-quoted line. Reiner directed Crystal for a third time in the romantic comedy When Harry Met Sally... (1989), in which Crystal starred alongside Meg Ryan and for which he was nominated for a Golden Globe. The film has since become an iconic classic for the genre and is Crystal's most celebrated film. Crystal then starred in the award-winning buddy comedy City Slickers (1991), which proved very successful both commercially and critically and for which Crystal was nominated for his second Golden Globe. The film was followed by a sequel, which was less successful. In 1992, he narrated Dr. Seuss Video Classics: Horton Hatches the Egg. Following the significant success of these films, Crystal wrote, directed, and starred in Mr. Saturday Night (1992) and Forget Paris (1995). In the former, Crystal played a serious role in aging makeup, as an egotistical comedian who reflects back on his career. Crystal starred in Woody Allen's critically acclaimed comedy ensemble film Deconstructing Harry (1997). Crystal had another success alongside Robert De Niro in Harold Ramis' mobster comedy Analyze This (1999). More recent performances include roles in America's Sweethearts (2001), the sequel Analyze That (2002), and Parental Guidance (2012). He directed the made-for-television movie 61* (2001) based on Roger Maris's and Mickey Mantle's race to break Babe Ruth's single-season home run record in 1961. This earned Crystal an Emmy nomination for Outstanding Directing for a Miniseries, Movie or a Special. Crystal was originally asked to voice Buzz Lightyear in Toy Story (1995) but turned it down, a decision he later regretted due to the popularity of the series. Crystal later went on to provide the voice of Mike Wazowski in the blockbuster Pixar film Monsters, Inc. (2001), and reprised his voice role in the prequel, Monsters University, which was released in June 2013. Crystal also provided the voice of Calcifer in the English version of Hayao Miyazaki's Howl's Moving Castle (2004). Crystal hosted the Academy Awards broadcast in 1990–1993, 1997, 1998, 2000, 2004 and 2012. His hosting was critically praised, resulting in two Emmy wins for hosting and writing the 63rd Academy Awards and an Emmy win for writing the 64th Academy Awards. He returned as the host for the 2012 Oscar ceremony, after Eddie Murphy resigned from hosting. His nine times is second only to Bob Hope's 19 in most ceremonies hosted. At the 83rd Academy Awards ceremony in 2011, he appeared as a presenter for a digitally inserted Bob Hope and before doing so was given a standing ovation. Film critic Roger Ebert said when Crystal came onstage about two hours into the show, he got the first laughs of the broadcast. Crystal's hosting gigs have regularly included an introductory video segment in which he comedically inserts himself into scenes of that year's nominees in addition to a song following his opening monologue. Crystal won the 2005 Tony Award for Best Special Theatrical Event for 700 Sundays, a two-act, one-man play, which he conceived and wrote about his parents and his childhood growing up on Long Island. He toured throughout the US with the show in 2006 and then Australia in 2007. Following the initial success of the play, Crystal wrote the book 700 Sundays for Warner Books, which was published on October 31, 2005. In conjunction with the book and the play that also paid tribute to his uncle, Milt Gabler, Crystal produced two CD compilations: Billy Crystal Presents: The Milt Gabler Story, which featured his uncle's most influential recordings from Billie Holiday's "Strange Fruit" to "Rock Around the Clock" by Bill Haley & His Comets; and Billy Remembers Billie featuring Crystal's favorite Holiday recordings. In the fall of 2013, he brought the show back to Broadway for a two-month run at the Imperial Theatre. HBO filmed the January 3–4, 2014 performances for a special, which debuted on their network on April 19, 2014. In 1986, Crystal started hosting Comic Relief on HBO with Robin Williams and Whoopi Goldberg. Founded by Bob Zmuda, Comic Relief raises money for homeless people in the United States. On September 6, 2005, on The Tonight Show with Jay Leno, Crystal and Jay Leno were the first celebrities to sign a Harley-Davidson motorcycle to be auctioned off for Gulf Coast relief. Crystal has participated in the Simon Wiesenthal Center Museum of Tolerance in Los Angeles. Crystal's personal history is featured in the “Finding Our Families, Finding Ourselves” exhibit in the genealogy wing of the museum. On March 12, 2008, Crystal signed a one-day minor league contract to play with the New York Yankees, and was invited to the team's major league spring training. He wore uniform number 60 in honor of his upcoming 60th birthday. On March 13, in a spring training game against the Pittsburgh Pirates, Crystal led off as the designated hitter. He managed to make contact, fouling a fastball up the first base line, but was eventually struck out by Pirates pitcher Paul Maholm on six pitches and was later replaced in the batting order by Johnny Damon. He was released on March 14, his 60th birthday. Crystal's boyhood idol was Yankee Hall of Fame legend Mickey Mantle who had signed a program for him when Crystal attended a game where Mantle had hit a home run. Years later on The Dinah Shore Show, in one of his first television appearances, Crystal met Mantle in person and had Mantle re-sign the same program. Crystal would be good friends with Mickey Mantle until Mantle's death in 1995. He and Bob Costas together wrote the eulogy Costas read at Mantle's funeral, and George Steinbrenner then invited Crystal to emcee the unveiling of Mantle's monument at Yankee Stadium. In his 2013 memoir Still Foolin' 'Em, Crystal writes that after the ceremony, near the Yankee clubhouse, he was punched in the stomach by Joe DiMaggio, who was angry at Crystal for not having introduced him to the crowd as the "Greatest living player". Crystal also was well known for his impressions of Yankee Hall of Famer turned broadcaster Phil Rizzuto. Rizzuto, known for his quirks calling games, did not travel to Anaheim, California in 1996 to call the game for WPIX. Instead, Crystal joined the broadcasters in the booth and pretended to be Rizzuto for a few minutes during the August 31 game. Although a lifelong Yankee fan, he is a part-owner of the Arizona Diamondbacks, even earning a World Series ring in 2001 when the Diamondbacks beat his beloved Yankees. In City Slickers, Crystal wears a New York Mets baseball cap. In the 1986 film Running Scared, his character is an avid Chicago Cubs fan, wearing a Cubs' jersey in several scenes. In the 2012 film Parental Guidance, his character is the announcer for the Fresno Grizzlies, a Minor League Baseball team, and aspires to announce for their Major League affiliate, the San Francisco Giants. Crystal appeared in Ken Burns's 1994 documentary Baseball, telling personal stories about his life-long love of baseball, including meeting Casey Stengel as a child and Ted Williams as an adult. Crystal is also a longtime Los Angeles Clippers fan and season ticketholder. Crystal and his wife Janice (née Goldfinger) married in June 1970, have two daughters, actress Jennifer and producer Lindsay, and are grandparents. They reside in the Los Angeles neighborhood of Pacific Palisades, California. In 1991, Crystal was honored by being given a star on the Hollywood Walk of Fame. Crystal, Billy (1986). Absolutely Mahvelous. New York: Perigee Trade. ISBN 0-399-51246-2. Crystal, Billy (2004). I Already Know I Love You. New York: HarperCollins. ISBN 0-06-059391-1. Crystal, Billy (2005). 700 Sundays. New York: Warner Books. ISBN 0-446-57867-3. Crystal, Billy (2006). Grandpa's Little One. New York: HarperCollins. ISBN 978-0-06-078173-6. ^ a b On page 17 of his book 700 Sundays, Crystal displays his birth announcement, which gives his first two names as "William Edward", not "William Jacob" Crystal, Billy (2005). 700 Sundays. Grand Central Publishing. p. 17. ISBN 978-0446578677. Sunday Number One. I'm born. March 14, 1948, in Manhattan at Doctor's [sic] Hospital overlooking Gracie Mansion. 7:30 in the morning. ^ a b c d e f g Fischler, Marcelle S. (February 27, 2005). "700 Memories of Childhood in Long Beach". The New York Times. Retrieved November 5, 2012. ^ a b Kane, Joe. "Jack Crystal: A Man To Remember". AllAboutJazz.com. Archived from the original on June 24, 2002. Retrieved January 16, 2008. ^ "Billy Crystal Biography (1947?-)". Filmreference.com. Retrieved January 16, 2008. ^ a b c Braver, Rita (November 6, 2005). "Life Is Short, Laugh Hard". CBS News. ^ "Billy is crystal clear". Woman's Day. Archived from the original on October 23, 2013. ^ "Billy Crystal The Hilarious Story About His Bar Mitzvah". Hudson Union Society. Retrieved February 1, 2019. ^ Ketchum, Diane (June 3, 1990). "Long Island Journal: Crystal Gazing". The New York Times. Retrieved December 4, 2012. ^ "Billy Crystal | Hollywood Walk of Fame". Walkoffame. Retrieved April 10, 2012. ^ "Billy Crystal Biography". Yahoo! Movies. Retrieved January 16, 2008. ^ Crystal, Billy (2013). Still Foolin' Em. Henry Holt and Company. p. 39. ISBN 9780805098204. ^ Crystal, in Lovece, Frank (December 10, 2012). "Crystal Clear: Veteran Comedy Star Discusses 'Parental Guidance' and his Sandy-Ravaged Hometown". Film Journal International. Retrieved September 6, 2013. ^ "Episode 740 – Billy Crystal". ^ a b c d e f Lipton, James (host) (October 8, 2007). "Billy Crystal, 2nd Visit". Inside the Actors Studio. Season 13. Episode 1307. Bravo. Archived from the original on October 11, 2007. ^ "Season 1: Episode 17 > Ron Nessen / Patti Smith > Billy Crystal Stand-Up". Saturday Night Live Transcripts. Archived from the original on September 23, 2013. Retrieved September 6, 2013. ^ "Season 22: Episode 77". The Tonight Show with Jay Leno. Archived from the original on February 8, 2014. Retrieved February 8, 2014. ^ "10,000 Pyramid aka 25,000 Pyramid aka 100,000 Pyramid". 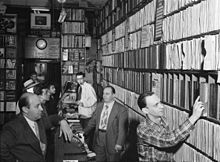 Archive of American Television. ^ "TV's gay characters, before and after Ellen". USA TODAY. Retrieved 2018-02-08. ^ "Billy Crystal | Encyclopedia.com". www.encyclopedia.com. Retrieved 2018-09-21. ^ Crystal, Billy (2013). Still Foolin' Em. Henry Holt and Company. p. 93. ISBN 9780805098204. ^ Maane Khatchatourian. "Watch: Billy Crystal and Josh Gad in 'The Comedians' First Trailer". Variety. ^ Maslin, Janet (9 April 1978). "Joan Rivers 'Rabbit Test' Film Depicts First Pregnant Man". NYTimes.com. The New York Times. ^ "Eddie Murphy drops out as Oscars host - CNN.com". CNN. November 9, 2011. ^ "Billy Crystal to return as host for 84th Academy Awards". Tvbythenumbers.zap2it.com. Retrieved April 10, 2012. ^ Keegan, Rebecca (2019-02-20). "The Politics of Oscar: Inside the Academy's Long, Hard Road to a Hostless Show". The Hollywood Reporter. Retrieved 2019-02-25. ^ "Oscars: "King" wins, show loses". Chicago Sun-Times. ^ "Billy Crystal's hit Broadway play '700 Sundays' coming to HBO". LA Times. December 4, 2013. Retrieved December 11, 2013. 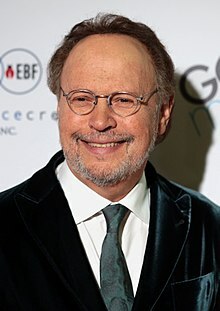 ^ "DVR ALERT: HBO Debuts Billy Crystal's 700 SUNDAYS Tonight". Retrieved April 20, 2014. ^ "Leno's autographed bike raises $500,000". USAToday. Associated Press. September 30, 2005. ^ "Finding Our Families, Finding Ourselves". Museum of Tolerance. Simon Wiesenthal Center. Retrieved 19 January 2018. ^ Chris Girandola. "Crystal strikes out in only at-bat". Newyork.yankees.mlb.com. Retrieved May 4, 2012. ^ "Yankees release Billy Crystal on 61st birthday – Baseball". Nbcsports.msnbc.com. March 14, 2008. Retrieved November 3, 2008. ^ Crystal, Billy (April 19, 2009). "Feeling Lonely Behind the Facade". The New York Times. Retrieved March 26, 2010. ^ "Billy Crystal Talks About Being a Loyal Clipper Fan". YouTube. ^ "Billy Crystal on Twitter". Twitter. ^ Staff report. "Billy Crystal loves the Clippers, and Jamal Crawford's dribbling". Sporting News. ^ Lee, Sandra Y. "Celebrity Parents: Billy Crystal". Parents.com. Retrieved May 4, 2012. ^ "Having Struggled From Warm-Up Act to Headliner: BILLY CRYSTAL". Time. October 19, 1992. ^ "2014 Emmy Nominations: 'Breaking Bad,' 'True Detective' Among the Honored". New York Times. July 10, 2014. Retrieved July 10, 2014. ^ Ford, Rebecca (July 10, 2013). "Steve Jobs, Billy Crystal to Receive Disney Legends Awards". The Hollywood Reporter. Retrieved July 18, 2013. ^ "Still Foolin' 'Em by Billy Crystal". stillfoolinem.com. Wikimedia Commons has media related to Billy Crystal.